News Alert: Due to a scheduling foul-up, we’ve lost the use of the City Park on Saturday. Consequently, all vendors will be located along 2nd street (the street next to the park). Below is an aerial view of 2nd street with the approximate Thieves’ Row location highlighted. “Thieves’ Row” for 2018! We have plenty of spaces available for vendors to set up and sell their wares during the festival this year! Vendor spots are 10’x10′ and there are NO utilities available. Thieves’ Row is going to be arranged along 2nd Street (starting in front of Park Place) and extending across the intersection down toward the Island Hotel. 2nd street will be closed to vehicle traffic beginning Friday at Noon to create a pedestrian mall for shoppers and visitors. All site will be paved, curbside locations. No electric or water is available, so if you require those… sorry can’t accommodate you this year. However, small portable generators will be allowed. The Cedar Key Pirate Invasion Weekend is open to the public and free of charge. The entire town of Cedar Key and all visiting tourists are free to attend the festival as often as they wish. This year we anticipate between 6,000 and 10,000 attendees, so there will be plenty of traffic through the area all 3 days. Setup will be Friday morning before noon. Teardown will be after 4:00pm on Sunday. Vendors must provide tents and tables. We are unable to accommodate early setups on Thursday due to city regulations. However, you can start as early as you like on Friday. There is free parking on the streets and the lots near the park. If you’re staying at nearby hotels you will have parking as well. Or you can park on the street just about anywhere in town that’s not posted No Parking. Especially be aware that the long parking spots next to the marina are reserved for boat trailer parking until 2:00pm. 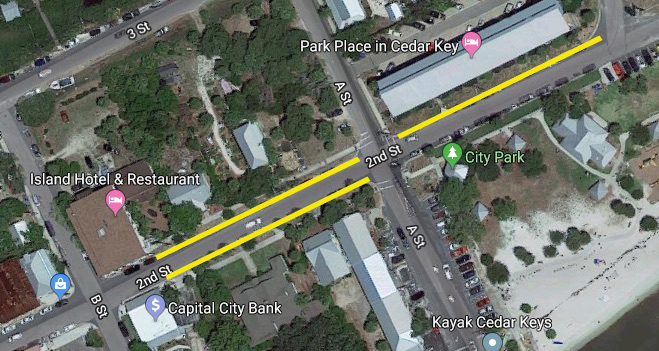 No security is provided by the town of Cedar Key, the Cedar Key Pirates, or the event promoters. Vendors are solely responsible for securing their booths and wares. The fee for a 10’x10′ spot will be $175. Or get a 20’x10′ for $350. And 30’x10′ goes for $525. Need more space? Contact us! All participating vendors will be listed on our Thieves’ Row page with website/Facebook links, if provided. For more details and questions, please contact the Park Coordinator. Please take note: Vendor fees are non-refundable! All vendors will be reviewed and approved for participation. “Pirate Themed” vendors are preferred! Submitting an application does not guarantee acceptance. We also encourage all vendors to get into the spirit and dress like a pirate of some sort. Send no money with your application. If you are accepted for the event, you will be contacted with payment instructions and additional details.